Quick and easy no bake dessert with 4 ingredients – Homemade Chocolate Coconut Candy Bars !!! This is the best sweet treat I’ve ever tried and the recipe is so simple and easy to make!!! It’s delicious snack for kids and perfect dessert for parties. 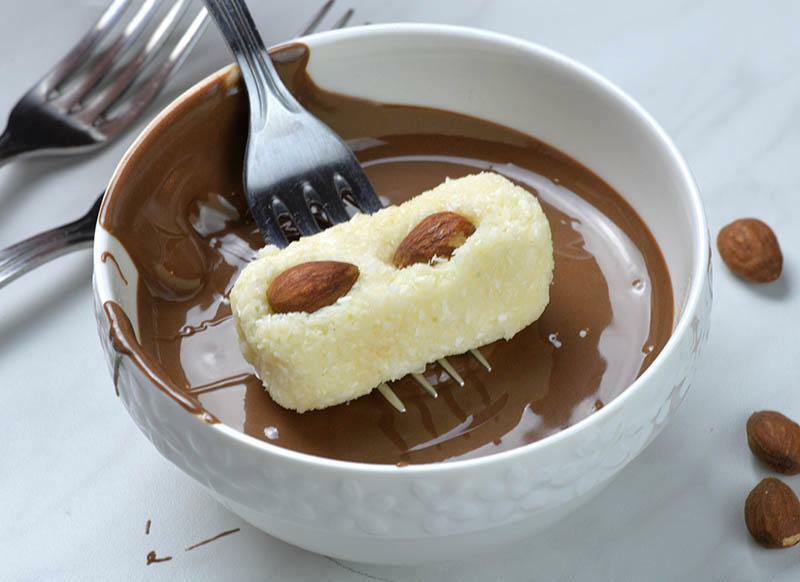 Believe it or not, for this simple recipe you need just 4 ingredients: sweetened condensed milk, coconut, almond and milk chocolate. Moreover, it’s ridiculously easy to make! 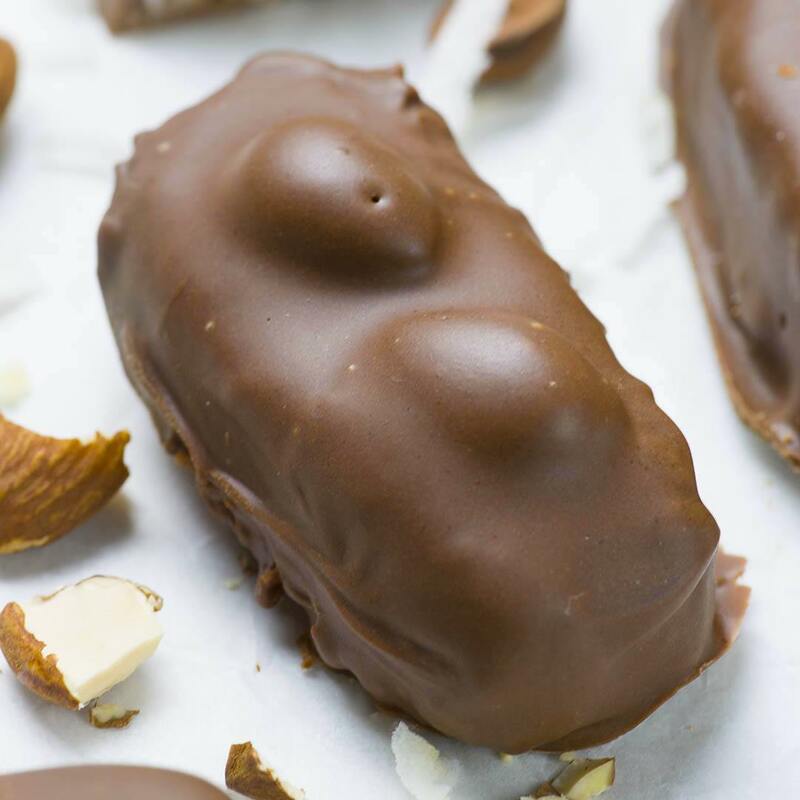 But believe me, these copycat Homemade Almond Joy Candy Bars taste out-of-this-world GOOD!!! Since Halloween is just around the corner, I suggest you to try these delicious homemade candy bars. Whether you’ll have a Halloween party at your home or just prepare sweet treats for “Trick-or-treating” these homemade candies will be a huge hit. Kids love candies and these Homemade Almond Joy Candy Bars would be delicious treat for kids from your neighborhood. Just pack each bar in some festive bag and you are ready for trick or treat on Halloween. After all, this recipe for Homemade Almond Joy Candy Bars is ridiculously easy and simple to make so don’t wait for the holidays. You can make it just for yourself on any regular day. When you try this homemade stuff, you’ll never again want to buy candy bars. And why would you when you can make it at home anytime. 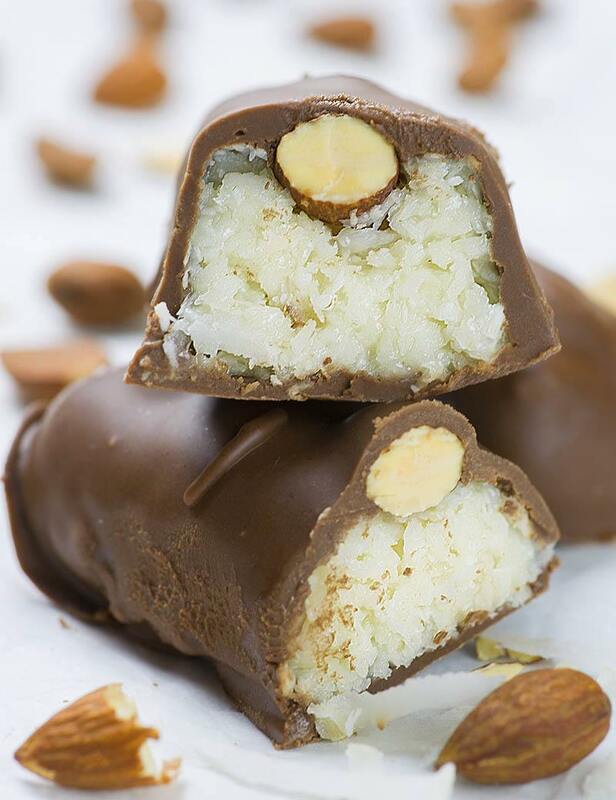 Also, I’m sure that these Homemade Almond Joy Candy Bars will knock you off your feet. Sweet and gooey filling coated with thick layer of milk chocolate, plus crunchy roasted almond on top…Sounds amazing, right?! When you make your own candy bars you can adapt it to your own taste. For this recipe, I used unsweetened shredded coconut, because sweetened condensed milk and milk chocolate make it sweet enough for my taste. But if you have a sweet tooth, you can add some sweetened coconut. Also, if you want to cut down the sweetness use dark chocolate instead of milk chocolate. I won’t change anything in this recipe, because I was really satisfied with the result. As I said previously, these Homemade Almond Joy Candy Bars are the best sweet treat I’ve ever tried. Quick and easy no bake dessert with 4 ingredients- Homemade Almond Joy Candy Bars !!! It’s delicious snack for kids and perfect dessert for parties. Line 8×8 dish with baking paper or aluminum foil leaving an overhand on each side, spray with nonstick spray, set aside. 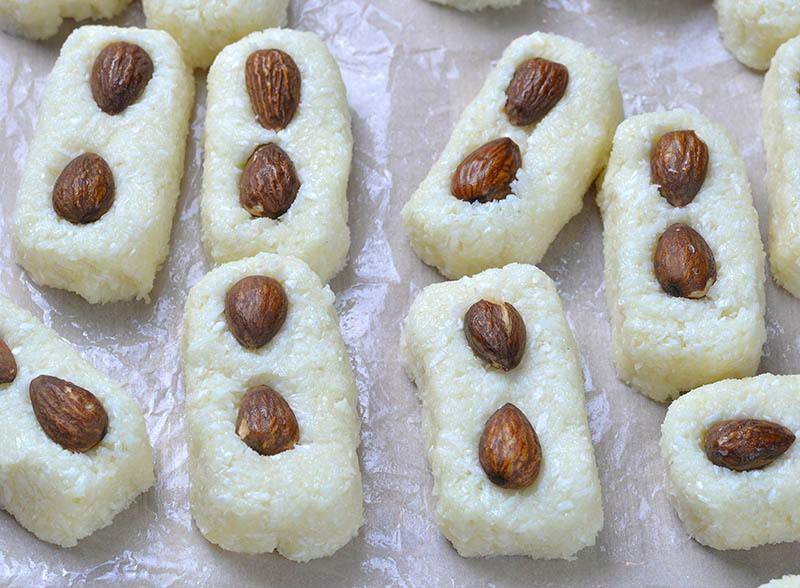 Stir together sweetened condensed milk and shredded coconut until evenly combined. Start with 1 can sweetened condensed milk and 2 cups of shredded coconut. Stir it well, if it’s too thin, gradually add more coconut until it’s thick, but not too dry. It will be a little sticky but should hold together in a shape when you squeeze it with your hand. Spread the mixture in prepared dish. The mixture is thick and sticky, so the easiest way to spread it into an even layer is to wet your hands with water and press the mixture with your palms, or use a wet spatula. Try to create an even layer and smooth the top as much as you can. Arrange roasted almonds on top and gently press with your palms to stick to the mixture. I made 18 bars from 8×8 inch dish, so I place 36 almonds on top (6 rows lengthwise and 6 rows crosswise; 2 per each bar). You can make smaller or larger bars, up to your taste. Place in the freezer for 15-20 minutes to firm. Transfer firmed mixture together with baking paper to cutting board. Cut the bars and separate them. Gently press with your fingers to make round shape on the edges. Place back in the freezer to harden completely, about 30 minutes. When the bars are firm, melt chopped milk chocolate. Line a tray with parchment paper, set aside. Take a few bars at the time from the freezer, so the rest won’t soften before you manage to cover the with chocolate. 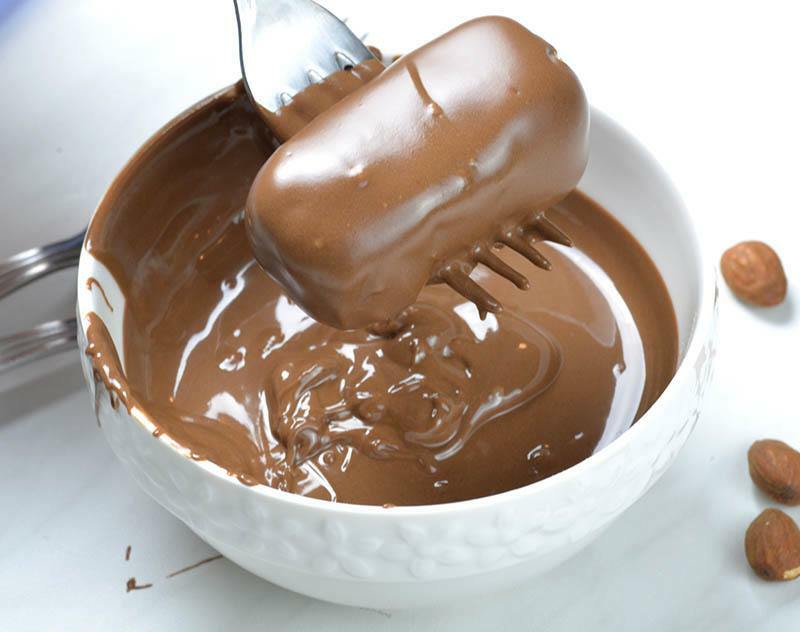 Using a fork dip each bar in melted chocolate to cover completely, tap the fork on the edge of the bowl to drip the excess of chocolate and transfer chocolate covered bar onto parchment paper lined tray. Place chocolate covered bars in the fridge or freezer until the chocolate has set. The amount of coconut might wary depending on brand of sweetened condensed milk and coconut that you use for this recipe!!! Some brand of condensed milk has thicker consistency and different brand of shredded coconut has different texture and moisture!!! These look so good, although I like Mounds better and would simply skip the almonds. The only other problem is that my kids hate coconut… wait… that means more for me! One of my favorite candy bars, will be making these. no nutritional info? need carb and fiber content please! Can these be kept in freezer til ready to eat for a couple weeks? I like to bake a lot at Christmas and like to start early. Thanks! I can’t wait to make these. Almond Joys are my family’s fave! Hi Jessica! You can make them ahead and freeze. Your recipe for Chocolate Coconut Candy Bars sounds delicious, but I would like to know if it’s necessary to refrigerate them. Hi Loretta, you can bring them to room temperature before serving. Do they have to be stored in the refrigerator? They look delicious?